On February 22, 2017, Textbook & Academic Authors Association (TAA) announced the winners of the William Holmes McGuffey Longevity Award. Included in the list of six winners was McCurnin’s Clinical Textbook for Veterinary Technicians, 8th edition by Dr. Joanna M. Bassert and John A. Thomas. Dr. Bassert is Director and Professor for the Program of Veterinary Technology at Manor College. The textbook is a core text for most of the Veterinary Technology programs in the U.S. and Canada. Additionally, it has been translated into many languages throughout the world. 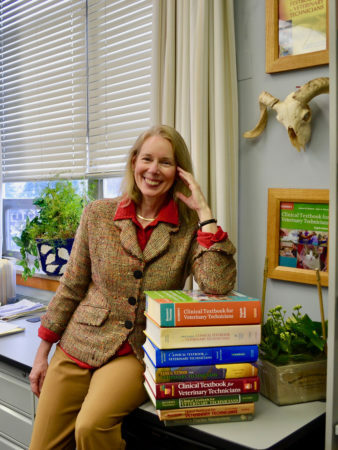 Dr. Bassert’s work on the book began nearly 20 years ago when she started on the Clinical Textbook for Veterinary Technicians when it was in its 5th edition. Bassert stated that this award “acknowledges the sustained effort of Dr. Dennis McCurnin (who worked on the first 7 editions) and me (who worked on editions 5-9). It also represents a passion for the profession and a vision for its role in veterinary medicine. Joanna Bassert has been working at Manor College since 1992. She has taught Introduction to Veterinary Technology, Clinical Pathology, Small Animal Procedures, Animal Anatomy and Physiology, and Sophomore Clinical Externships. Her academic specialties and interests include Comparative Mammalian Anatomy and Physiology. Dr. Bassert will be accepting the William Holmes McGuffey Longevity Award early this Summer. Congratulations Dr. Bassert!